Discount Tickets Available For Katie Greer’s Lecture On Internet Security | DISCOVER YOUR GIFTS! 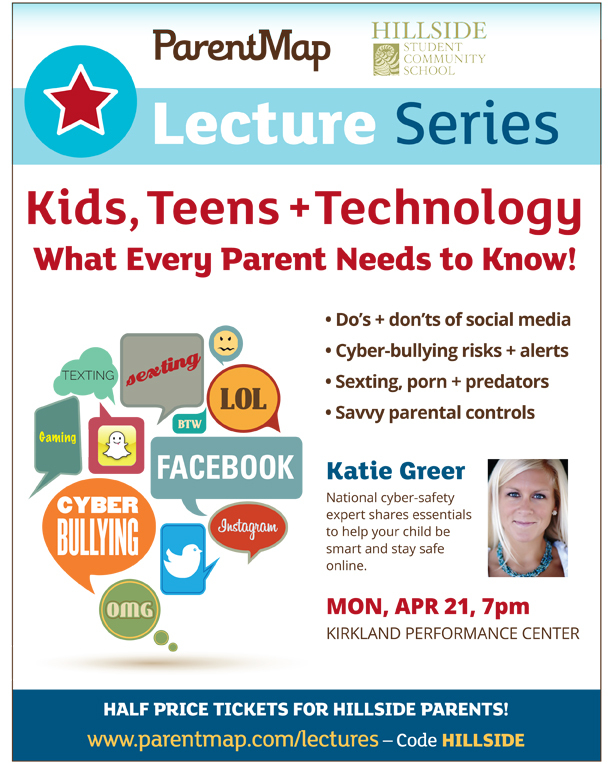 Due to the generosity of several Board members, we are have been able to schedule Katie LeClerc Greer, an internet/technology specialist, to come to Hillside on Monday, April 21st, to talk with students about how to stay safe on line. We had initially planned to open this talk to the whole community but after consulting with her, we have decided to open it up to students and staff only. Parent Map has very kindly offered us discount tickets to her evening lecture in Kirkland which is geared more to the concerns of parents and the role they can play in keeping their children safe. When you go online (www. parentmap.com/lectures) to sign up for tickets, just use the code HILLSIDE to receive your discount.